Savannah, the small city in Georgia USA, has inspired the a bewildering array of groups - sludgy riffs of Baroness, Circle Takes the Square, and Unpersons, with Kylesa probably the most successful of the lot. For the past 12 years, they've strengthened their dual hazy metallic psyche, and it's a surprise that their sixth outing, Ultraviolet, is their most stale, generic and lifeless record yet. Previous Kylesa albums have worn their influences on their sleeve: 70s psychedelic rock and crust punk mixed with sludge metal. Even the previous full-length, 2010’s Spiral Shadow, was an intelligent and excellently paced execution of what had become the ‘Kylesa sound’, a rough-edged harmonic male-female back and forth vocal overlaid with a powerful sludgy guitar and propped up by the big orchestral oomph of two drummers. Though both Spiral Shadow and Ultraviolet are produced by vocalist and guitarist Phil Cope, Ultraviolet is stuck in a sea of overproduced melody and undervalued noise. Where in previous records the abrupt about-face decibel-hike of a thudding riff effectively juxtaposed against Laura Pleasants’ lilting tones, here the production has equalised these parts. The result is an album free of musical punctuation. Their former energy and immediacy is replaced with a distance not unlike latterday Torche vehicles, but without that group's hugely enjoyable lightness. More than ever Kylesa feel stuck in one orbit, the crust punk rocket fuel that propelled their first records now totally spent as the 70s rock influences have come to the fore at the expense of everything else. Self-indulgent solos are pitched into the mix at the same level as the rest of the guitar work, perhaps in a cynical bid to appease fans of Uncle Acid and the Deadbeats, but the sound is still too abrasive for that and the new ideas don’t fit into the existing structures. For all of her increased airtime here, lead guitar and key sonic component Laura Pleasants feels less present than ever. Her distinctive vocal has become, like the rest of the album, more focused on melody and drained of character. Another signature sound, the orchestral depth brought to Spiral Shadow by doubling up on drummers, is unnoticeable on Ultraviolet. Just like their hometown jam-buddies Baroness’ latest Yellow and Green, there is a tendency to slide into generic sludge tropes. 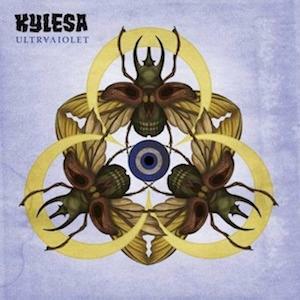 Kylesa have brought more melody and slow-jam bum-gazing to proceedings, hoping that the album being more dense might be mistaken thoughtfulness. In an effort to stave off decay, Kylesa seem to have employed a variety of new ideas without any coherent force driving the album. Fans of the characteristic Kylesa stomp will find enough of it remaining in the cracks to keep them entertained, but the originality and kinetic force of their vision has become a splutter.